This year YouTube celebrated it’s 10th Birthday. It’s had such a profound impact on the way we produce, view and share video online that it’s hard to imagine the web without it. YouTube was fundamental in bringing video to the web – what’s the next step in the relationship between the web and video? But technologies like Touchcast, Popcorn.js and Zaption – to name just a few – claim that they are bringing the ‘web to video’. They allow producers to make their content interactive by enabling their viewers to click on the video to connect to related articles, videos and real-time data. Producers can also include quizzes, questions and collect audience feedback as well as detailed analytics. 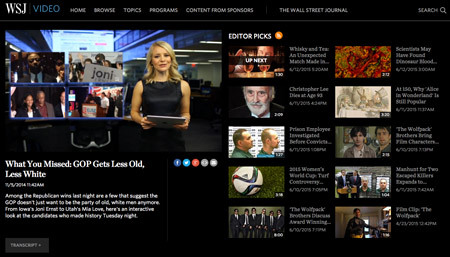 Earlier this year, international news provider the Wall Street Journal began using Touchcast to create interactive video. They described it as one of “the most important things they were going to be doing in 2015.” They are keen to tell the viewer that they now “control the story”. In February this year we saw the launch of YouTube’s multi-angle editor which enables viewers to choose their own camera angle during a live or recorded performance. But what interests me the most is how video can become more integrated with the web. As video becomes more interactive and clickable we will see the boundaries between web and video dissolve and the integration of the two becoming increasingly seamless.